Prolific veteran Rosen (Dead Ball, 2001, etc.) profiles a winsome pet, but it’s definitely not the usual lovable animal book about the usual fluffy creature. The author traveled to Santa Fe to meet a blameless ménage à trois: talented sculptor Veryl Goodnight, her stalwart husband Roger Brooks—and, tipping the scales at nearly one hairy ton, a young buffalo named Charlie. The childless couple adopted this juvenile bison (Rosen employs the terms “buffalo” and “bison” interchangeably) and nursed him through accident and illness. It wasn’t easy. They relied on aid from several friends, skilled veterinarians and one animal chiropractor. But they fell so hard for the big ruminant that at one point retired CIA flyer/airline pilot Brooks discussed making Charlie a beneficiary of his will. 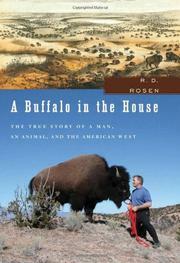 Within this yarn of a buffalo and his human family, Rosen intersperses some Western history, Native-American lore, buffalo husbandry and the politics of herd management. (Not mentioned: the burgeoning buffalo-meat industry). Goodnight is descended from pioneers who helped save remnants of America’s mighty buffalo herd during the Great Slaughter of the mid-1800s, when sharpshooters and tourist swells nearly reduced the huge animals to piles of bones and some lap robes. But Charlie remains the central character, a gallant bison for whom anthropomorphism is pushed to the limit. Surprisingly, perhaps, the story of where one lone buffalo roamed proves mightily affecting. Humane Western fable about a horned, bearded youth and the people who loved him.